Ever since I was little, I have thought that my mom was one of the most fashionable people, ever. Now at age 55, she still rocks the skinny jeans, designer handbags, and oversized sunglasses like nobody's business. I've mentioned this before but she hates how I dress (exhibits A and B). It blows her mind that some people read my blog for my insight into personal style. Just the other day, I was wearing a housedress she had bought me from Thailand, thrown together with a lace kimono and cutoffs and she was like, "Why you wear so many things? No one knows where to look when they look at you." It's called layering, mother, and Pinterest assures me it's a thing. When it comes to her own style, my mom likes to keep it simple... except for her quips and critiques. I swear, if she and Michael Kors ever got into a fashion insult battle, my mom would shame him to silence. 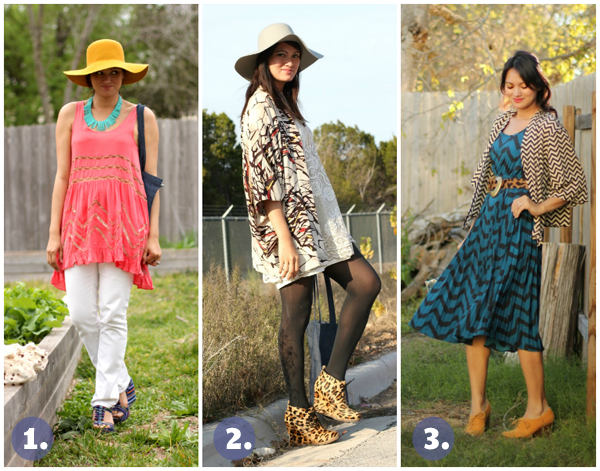 Out of curiosity and for big laughs, I showed my mom three of my favorite outfits from this year to see what she had to say about them. 1. "Why that hat? You look like you work in the garden. Pink and yellow and the blue? Please. I'd be embarrassed to be seen with you." 2. "I have that hat. I wear it when I go fishing. This jacket okay. That dress okay. Those shoes not okay with that jacket. Leopard doesn't go with everything, you know." 3. "I don't understand this. What did you do? It looks like you fell in your closet and just came out wearing what fell down on you. Cheetah and stripes and different stripes? The only thing that matches is the belt and the shoes." 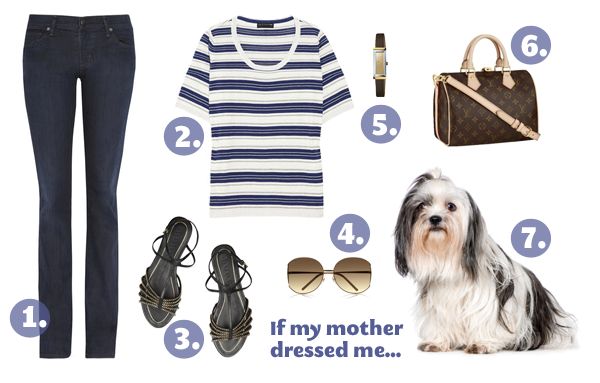 If my mother dressed me, I'd be wearing: 1. dark, designer jeans // 2. high quality but simple t-shirts // 3. strappy sandals // 4. designer, oversized sunglasses // 5. small, designer watch // 6. legacy handbag // 7. I'd carry a shih tzu. In fact, I showed her the above collage and she said, "Oh, that my stuff! I love it all! That my bag and my dog and my glasses! Who makes those shoes? I want them. I love everything in this photo." And this is why, even though I think she is incredibly fashionable, I could never, ever let her pick out my clothes (or dog). I have decided that she and I are just going to have to agree to disagree. Thankfully I usually think she's hilarious and spot on. Sometimes I think we should have our own reality tv show. Certainly we're no ladies of Big Rich Texas (oh, man, talk about mama drama!). But if my mom and I had big money, big hair, big attitudes, and even bigger drama, we'd certainly fit in over there... if you could get past her thick accent. I know it's uncouth to admit this, but I love reality tv. Combined with my love for fashion and my own mama drama, I think I could love Big Rich Texas and can't wait to tune in. I for one, am looking forward to checking it out. Big Rich Texas premieres Sunday October 7 8/7c on Style.